Rencontrez votre guide privé sur la place Virgen ou la porte de Serranos pour une visite personnalisée de Valence. La réservation d'une visite privée signifie que vous disposez d'une flexibilité totale en termes d'arrêts qui vous intéressent et qui intéressent votre groupe. vous pouvez travailler avec votre guide pour élaborer un itinéraire. We met our guide to find that the tour was just for me and my partner - which was excellent. Our guide Sonia was fantastic, so full of enthusiasm and knowledgeable about her city. She had a folder of photo's to show various festivals and events through out the year giving a wonderful insight into Valencian life. We covered a wide area and at all times Sonia would point out little items that you would have missed if just walking on your own. The 3 hours passed very quickly and the tour set us up for our own more detailed visits through out the next 2 days. 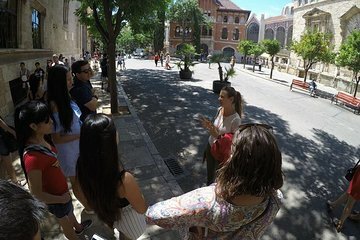 Sonia spoke excellent English and I would recommend this tour as a start to your visit to the city as you can miss so much with out the information given.